It was made by one of Hollywood’s most successful producers, starred the iconic John Wayne and featured Susan Hayward – who was nominated for five Academy Awards and won one of them. Yet, it often makes the list as one of the worst movies ever made by Hollywood. 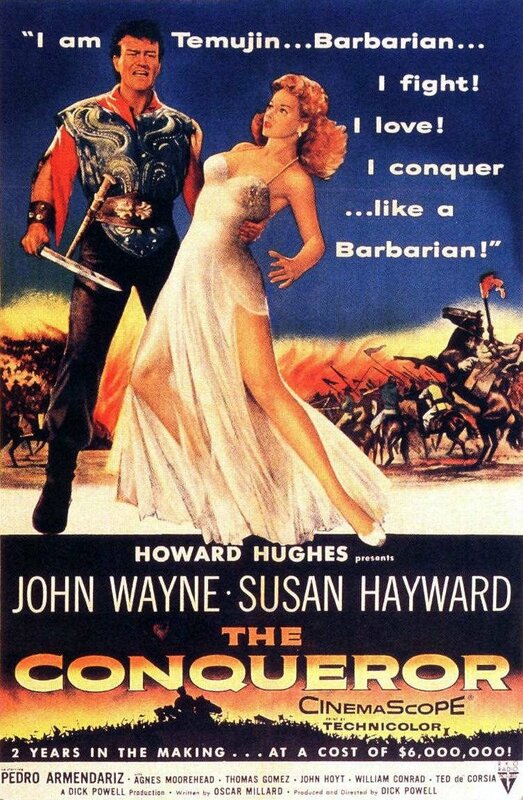 The Conqueror tells the story of Temujin/Genghis Khan, as played by John Wayne (yes, you are reading that correctly) who raids a caravan going across the Mongol Steppe (in reality it was filmed in Utah) where he captures the Tartar Princess Bortai, played by Hayward. The story continues with Temujin desiring Bortai, and while she at first despises the Mongol leader, gradually she falls in love with him. There are various fights and battles, as Bortai’s father tries to get her back; meanwhile Temujin suspects that one of his followers might be trying to betray him! While audiences did come to see the film – it made $4.5 at box office – critics savaged it for its horrible miscasting and terrible dialogue. However, the film has an even worse legacy – much of the filming was done just a few miles from a nuclear missile testing site in Utah. Within a few years many members of the cast and crew started to be diagnosed with cancer. Eventually the director, Wayne and Hayward would all die from cancer, and 91 of the 220 people who took part in the filming suffered or died from the disease. The producer, the legendary Howard Hughes, was so overcome with guilt by the deaths that he bought every copy of the film for $12 million. It was only after his death that the film would be seen again by audiences.